I have a 2014 Dodge Grand Caravan 30th edition, 3.6 liters V6 pentastar engine with only 21k miles. Its a wheelchair van and isn't driven much. I have recently put a new battery in the van. Drove it for approximately 200 miles but the O2S and EGR monitors are NOT READY, 6 others are READY. No codes and No Check Engine light and the van runs and drives great. I was told by the CA Smog tech and a local auto shop tech just to drive it more. 400 miles since installing new battery, I have replaced oxygen sensors 1/2, 2/1, 2/2, all Mopar parts. Battery was disconnect at this time. Now, 600 miles since last battery disconnect, with 3 new O2 sensors and again the two monitors that are NOT READY are O2S and EGR. 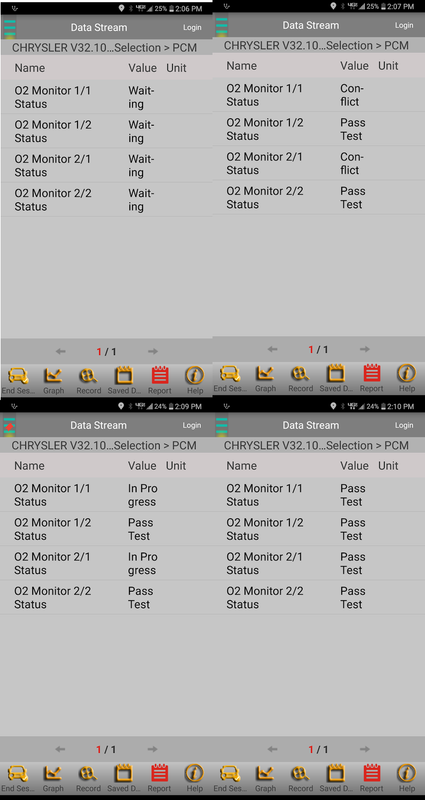 I have done, many, many drive cycles, generic and chrysler. All together, driven over 1000 miles. I have some datastream captures I would like to post. Perhaps someone will see something unusual and guide me in the right direction. Doing some revving... Looks like 1/2 slow to recover? But it does eventually. Next, I shut engine off and let it cool down for 10 minutes. Restarted the engine and this is what I see. For some reason 1/2 almost drops out compared to 2/2. Which one look normal? Is it reporting high oxygen level? The next day I decided to do some more testing. At first I tried to run 1/2 signal through my body to Batt+ and Batt- but it had little effect on the signal. So then I momentarily shorted 1/2 signal to ground, then short to battery + post with a wire. You can see it on pic below. That shock to 12v somehow awakened the 1/2 and PCM started to show 1/2 and 2/2 around 0.8 volts. Maybe this will help. I came across a video on youtube that happens to show same van and the 1/2 also shows under 0.14 volts just like mine. I don't know if they are also having the same problem or this is normal thing? In summary, I can not get O2S and EGR to set Ready. Do I have intermittent 1/2 sensor signal problem as the cause? Please don't hesitate to post, please, I really need a hand to fix this issue and get the O2S and EGR monitors set. Last edit: 22 Oct 2018 00:46 by Flywheelz. Recorded a recent capture of downstream sensors. Anyone see a potential fault? Will your Launch allow you to look at Mode $06 data? 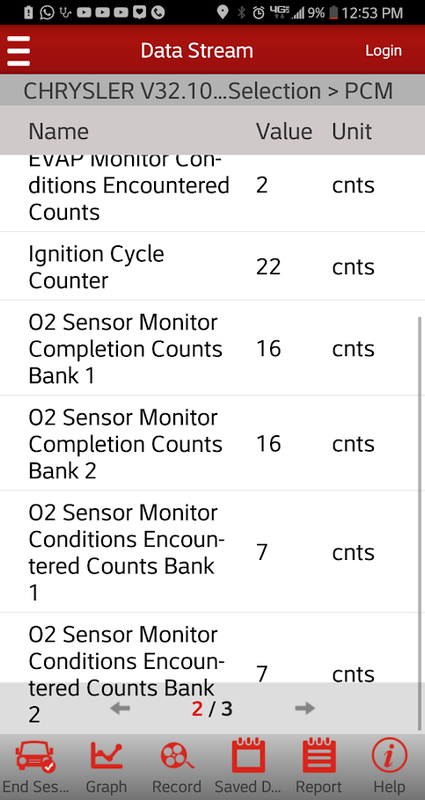 I'd dig into the TIDs for the O2 and EGR monitors to see which specific test isn't completing. Even if the test description isn't there (or isn't accurate), we can search service info with the TID#. That might give you some insight in which part of the monitor hasn't passed. Obviously there's no EGR system on your Caravan. Pretty sure it's referring to the VVT system, which MAY be waiting to show Ready until the O2 completes. I think you're right to focus on the O2 monitor for now, and attack the EGR monitor afterwards if needed. Tyler, thank you very much for your post. I will check if there is Mode $06 tomorrow and report back. Are you familiar with Mode $09? Do you know if there is a minimum counter count for the O2 and EGR/VVT before they go Ready? Perhaps it needs more starts/stops vs miles or maybe cool downs required? I've captures these in Mode $09 In-Use Performance, after doing drive cycles for 3 days straight driving 350 miles. At that time I also entered some function that showed live data as I was doing the Drive cycle for O2. It showed, Waiting, In-Progress, Pass Test. Sometimes it would report Conflict for upstream sensors. But eventually all Passed. Finally, took few more screenshots of these results. I was able to enter Mode $06 with my scantool and don't see anything that failed. I am going to hook up a DVM to O2 B1S2 Sig Return to see if 2.5v is dropping out while driving. According to this Doc, the first MIDs are Oxygen Sensor Monitors. Perhaps I need to do a Drive cycle then look at Mode $06 because many test show 0's and there are few test values at the limits. Honestly I don't know what to look for. Anything jumps out at you? So I hooked up my DVM to Return pin, I get stable 2.51V idling or driving. Then I did a computer response test and it does react to 12v. Then drops to around 0.5v then drops back down to 0.10-0.14v. Its as if the PCM is grounding out the signal. Bad PCM? Last edit: 07 Feb 2019 00:10 by Flywheelz.